Feral Planet is a new publishing company started by Michael Friedlander, the former CEO of FPG Inc. (Guardians). Their first project was successfully fired up on Kickstarter: Goliath, a fully-painted story book written by Mr. Friedlander and illustrated by Mike Ploog (famous for his many designs for Hollywood movies). 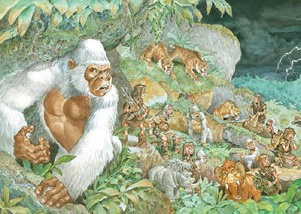 “The story follows the adventures of a small family of prehistoric people named the Ty clan. The Ty clan live in very difficult times and face incredible dangers every day. To survive, they must embark upon an epic journey to find a new world and the peace they have always dreamed of. They find great strength and determination in their belief in magnificent stories passed down through the generations that speak of giant white guardians that protect and watch over them. As the story unfolds, we will find out if these are just age-old tales the clan elders tell while sitting around the fire or if these great guardians prove to be so much more…” It’s available to order in hardcover over at Previews, and it’s expected to hit the shelves before the end of December. He Can Talk. Will You Listen? 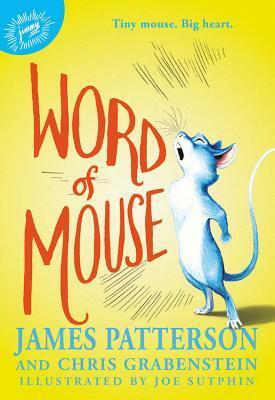 World-famous author James Patterson (Zoo) has returned with a new novel for young readers: Word of Mouse, written with the help of Chris Grabenstein and illustrated by Joe Sutphin. It’s the story of a very special mouse. “What makes Isaiah so unique? First, his fur is as blue as the sky–which until recently was something he’d never seen, but had read all about. That’s right–Isaiah can read, and write. He can also talk to humans…if any of them are willing to listen! After a dramatic escape from a mysterious laboratory, Isaiah is separated from his ‘mischief’ (which is the word for a mouse family), and has to use his special skills to survive in the dangerous outdoors, and hopefully find his missing family. But in a world of cruel cats, hungry owls, and terrified people, it’s hard for a young, lone mouse to make it alone. When he meets an equally unusual and lonely human girl named Hailey, the two soon learn that true friendship can transcend all barriers.” Word of Mouse will be available in hardcover this December. Another giant monster comic — this time, a black & white classic returns. According to Previews: “The giant kaiju return to ravage the Earth in the first volume of cult genre legend Mike Wolfer’s War Monsters! Originally released in 1987-89, Wolfer’s Daikazu series was his first published work, and issues #1-5 of the giant monster rumble are collected here for the first time ever in one giant volume! 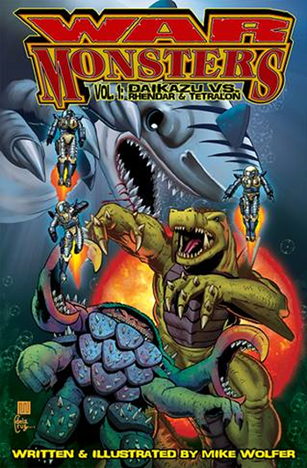 On a remote Pacific island, a group of strangers accidentally stumble upon the secret, underground base of a mad geneticist responsible for the creation of two gigantic behemoths, and only the ancient ‘god’ Daikazu stands against them in an earth-shaking battle that climaxes in downtown Tokyo!” The first issue arrives with a Bang at the end of November. Boom! 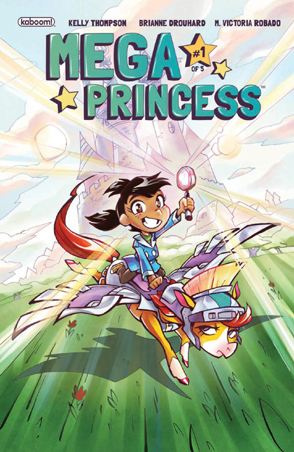 Studios have a new full-color comic mini-series called Mega Princess — with an interesting sideways anthro-angle. “During Princess Maxine’s 10th birthday, her fairy godmother grants her the gifts of EVERY fairy tale princess, which…sounds a lot cooler than it actually is, in Max’s opinion. She doesn’t want to sing on key or feel a pea under 20 mattresses-she wants to be a detective! At least the power to talk to animals is cool, but her pony Justine is downright saucy. They don’t get along. When her little brother, Prince Robert VI (better known as Baby Bobs), goes missing, Max and Justine are on the case, and her new Mega Princess powers just might come in handy after all!” It’s written by Kelly Thompson (Jem and the Holograms) and illustrated by Disney artist Brianne Drouhard. The first issue is on the shelves now. How did we ever miss these? Katherine Applegate is a writer of books for young readers, who has some interesting anthropomorphic credentials. The One and Only Ivan is a Newberry Award-winning novel from 2013 about a very special gorilla. “Inspired by the true story of a captive gorilla known as Ivan, this illustrated novel is told from the point of view of Ivan himself. Having spent twenty-seven years behind the glass walls of his enclosure in a shopping mall, Ivan has grown accustomed to humans watching him. He hardly ever thinks about his life in the jungle. Instead, Ivan occupies himself with television, his friends Stella and Bob, and painting. But when he meets Ruby, a baby elephant taken from the wild, he is forced to see their home, and his art, through new eyes.” Take a look over at Amazon. Then more recently, and even more anthropomorphic perhaps, there’s Crenshaw from 2015. “Jackson and his family have fallen on hard times. There’s no more money for rent. And not much for food, either. His parents, his little sister, and their dog may have to live in their minivan. 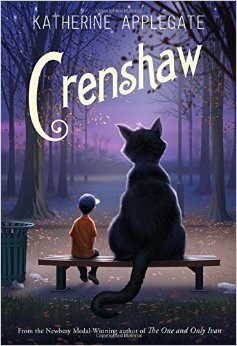 Again… Crenshaw is a cat. He’s large, he’s outspoken, and he’s imaginary. He has come back into Jackson’s life to help him. But is an imaginary friend enough to save this family from losing everything?” Guess we’ll find out soon enough. It’s also available at Amazon. Thanks to Animation News Network we found out about an article over at the Hollywood Reporter. 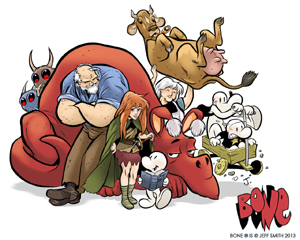 It seems that Mark Osborne (director of Kung Fu Panda and the recent film The Little Prince) has been tapped to finally adapt Jeff Smith’s award-winning comic Bone for the cinema — not just as one animated movie, but an entire trilogy to be produced by Warner Brothers. “The comic told of three Bone cousins — Fone Bone, Phoney Bone and Smiley Bone, all small, bald and human-like creatures with big noses — who are separated and lost in a vast uncharted desert after being run out of Boneville. One by one they find their way into a deep forested valley filled with wonderful and terrifying creatures. 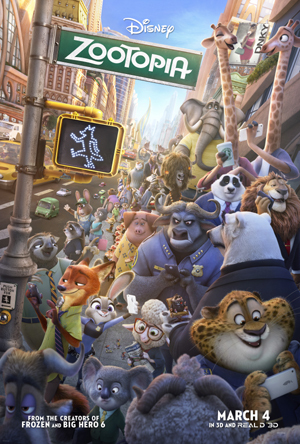 The comics were published from 1991 to 2004 and then rediscovered by a new and more mainstream generation when Scholastic began releasing them in graphic novel form.” Adam Kline is writing the script for the first film, along with Mr. Osborne, and Animal Logic (Happy Feet) are involved as well, so expect some top-notch CGI. We’ll let you know when we find out a release date. Giant Monsters Are On Their Way! 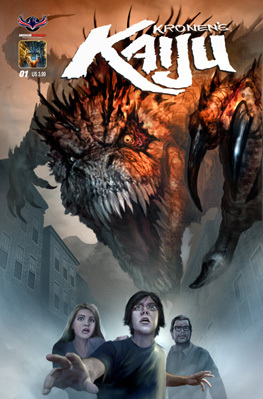 But enough about the recent election… Kronen’s Kaiju is a new full-color comic series written and illustrated by Chris Scalf (Werewolves vs. Dinosaurs). “Giant freaking city crushing monsters are real! Darren Kronen lives in a small town. His friends all think he’s an awkward nerd living in a fantasy world obsessed with make-believe creatures and monsters. He even writes a blog called ‘Kronen’s Kaiju Chronicles’ where he speculates about the creatures of legend he obsesses over. But after a series of unexplained earthquakes brings teams of scientists and authorities into town to investigate, Darrin’s obsession grabs the unwanted attention of high level officials when details on his blog match the strange phenomenon that is secretly being investigated!” They’re coming to comic stores this December, thanks to American Mythology. Find out more over at Previews. Study Group Comics is a very large collective of writers and artists creating a whole slew of mini-comics, zines, and webcomics. Among them is Magical Character Rabbit, an on-line comic story created by Evans Kinoko. “Magical Character Rabbit is the tale of a young Magi who lives in an enchanted city full of wizards, witches, and warlocks. When she’s entrusted with performing the big Winter Solstice Ritual in front of the whole town, she must go on a quest to find the perfect spell as well as the courage to go forward. An engaging, all ages fantasy for fans of Richard Scarry, Hilda, and Steven Universe!” You can check out the on-line comic at the Study Group web site, but recently they’ve also released a one-shot version on paper which you can find at their Shop.